Education Prof Benita Bruster was invited to work with five 4th grade boys identified as struggling readers. When she asked them to suggest a favorite poet, the response was not unexpected “Poetry is dumb”, “Girls like poetry”, etc. Drawing on some cutting edge academic research (see Turn Your Boys to Readers on page 14), Benita predicted that boys would enjoy poems that were “silly, bizarre, gross, or absurd”. 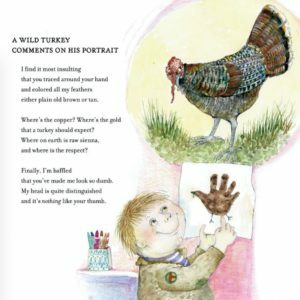 She chose her start with the poem, A Wild Turkey Comments on His Portrait. After modeling, the boys would participate in various repeated reading activities designed to improve their confidence in their reading ability. We chorally read poems, sang poems, read them with overly exaggerated expressions, like they were the saddest story in the world. At one point, while a local children’s opera was performing at the school, the boys all wanted to turn the poems into operas. 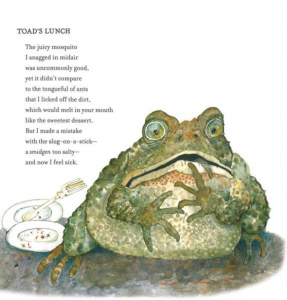 By the end of the first week, the boys were asking when it was going to be their turn to pick the poem…. At the conclusion of each poetry activity, the boys spent time recording their comments about the day’s activity on our group’s Kidblog. I established our Kidblog as a means for the students to share their feelings about the poems in a non-threatening and safe environment. It is important that students experience the writing process in such a way as to encourage their individual growth a writers without crushing the enjoyment of writing. Reading and writing are integrally connected. In order to be accomplished as a reader, one must also experience writing. “it was funny when ti said dum. the hole poem was funny. ti was fun. subject of my poem really excited them. It was important that the boys saw me creating poetry and taking a risk right along with them. I did not force the one boy who did not want to write a poem to participate in activity; he expressed to me that he had no good ideas and did not know how to rhyme. We discussed that not all poems have to rhyme and casually worked on brainstorming ideas from his daily life and interests that he could use as a starting point. My time working with this student was cut short as he was often pulled for math intervention during our small group. I was pleasantly surprised that towards the end of my time with the students he posted a surprise poem on our Kidblog. He actually wrote his own poem because he was motivated from within not because I was forcing him to do it; he knew he could do it and was personally motivated! 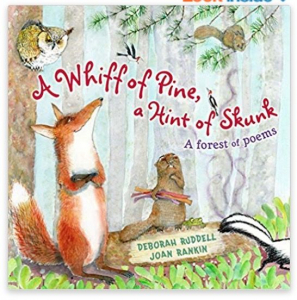 Bravo to Ruddell and Rankin for a great book, and Benita for her wonderful example in teaching!